Get Started Here: The Freestyle Starter Basic Package is a great set up for learning better balance. You can create 3 different board types using the Ball and Half Ball combos. When you are ready to progress in skill you can always add Balls and Half Balls. This is the board that started it all for me. After a few days of working with the board it changed the way I walk, ran, and squatted. I would even argue that the use of this board changed my mental outlook on fitness as a whole. The coolest benefit has been the development of my calves/shins. As a thin guy, the lower part of my legs would never develop regardless of the amount of time I spent training them. This board changed that for me. I use the Freestyle Starter along with the Surf Original for my pre and post workout routine. Not much for me to say other than I love this. I also loved the customer service. Very helpful with suggestions,so I felt confident I was getting exactly what I wanted. I've had my SI-Board for a few weeks now. I use it everyday for about 15 minutes a day. I've progressed to balancing on 2 small balls. Great workout. I use it on a carpet so it feels very safe for me. Elysia provided the absolute best in customer service. I purchased the Freestyle Starter Basic Package for my boyfriend for Christmas. The package was a a great deal for a total of 4 items and at first the shipping price seemed a bit high but when I received the board in 2 days it was worth it. 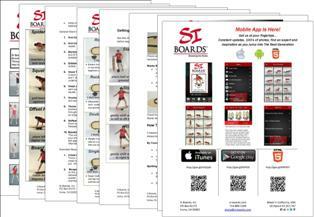 I will be recommending this website to all my friends who.are looking for a So Board!